This Anker PowerCore 20100 Power Bank Power Bank review is thanks to the Macfixit website. When they asked me to review any product from their website I looked at the product listings and realised that they didn’t just sell Apple accessories. 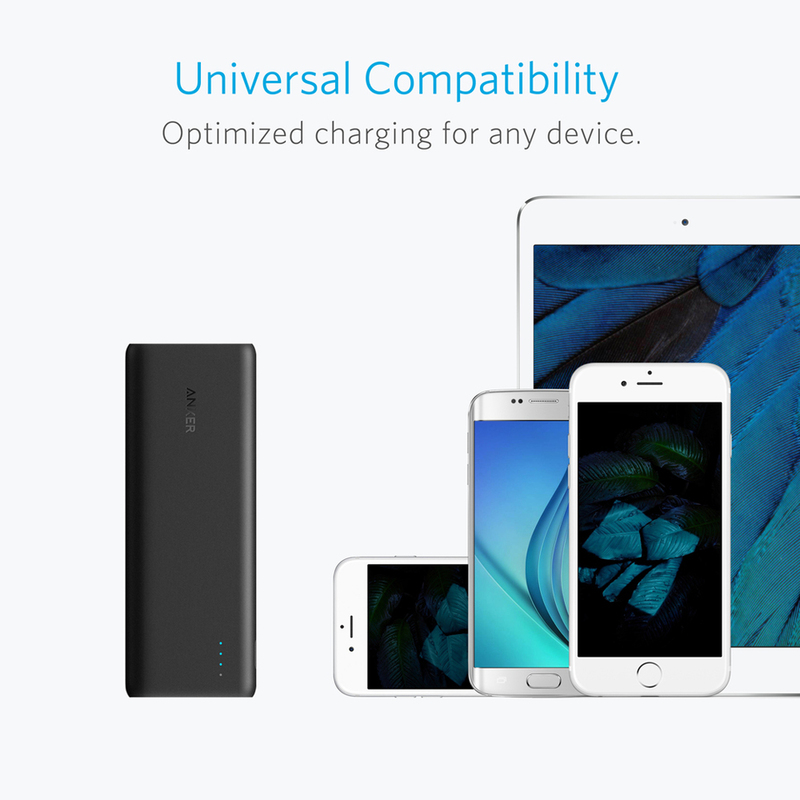 I chose a Anker powerbank because while not well known in Australia, the Anker brand is highly trusted in the USA. In the Anker PowerCore 20100 box you’ll find the powerbank battery itself, a little welcome guide manual, a USB to micro USB charger cable and a mesh carry case. Click the photo thumbnail above to see the Anker PowerCore 20100 unboxing photo at full size. Click the photo thumbnail above to see the Anker PowerCore 20100 manual at full size. Anker sells several portable battery charger models with a capacity of about 20000mah as well as models that are smaller with lower capacity and bigger with 26800mah capacity. The reason that 26800mah is the largest capacity is because power banks are popular with travelers. Aviation laws around the world limit you to transporting laptop or portable batteries with a capacity of less than 27027mAh (100 Watt Hours). External batteries lose charge over time but so slowly it would take roughly 2-3 years for the Anker PowerCore 20100 to drain completely. It’s also worth noting that any powerbank’s chemicals will become less active if left unused for extended periods. To extend your Anker Powercore life, you should discharge and recharge it at least once every 120 days maximum. When the Anker PowerCore 20100 is charging your devices, the LED indicator will stay on displaying the powercore’s remaining power and will turn off when the device is fully charged and not drawing a current. When the powercore is being charged, the remaining power of the LED indicators will light steadily; while the next charging LED indicator will flash. And they will turn off when the PowerCore 20100 is fully charged. If your device can only charge at less than 2.4 amps eg 1 Amp, the PowerCore 20100 will not damage it. It will only supply the maximum charge amps allowed by your device. Did you know that approximately 30-40% of an external powerbank’s battery capacity is unable to be used because of efficiency problems that affect all electronics devices? Reasons include power lost from circuit heat and voltage conversions from the battery, the charging cable and your device. Your battery is able to supply 60%-70% power of it’s 20100mah capacity to devices you’re charging from it. This means that for example if you have a phone with a 3000mah battery, the Powercore 20100 could recharge it from flat 4-5 times. This depends on the quality of the charger cable used, how old the powerbank is etc. 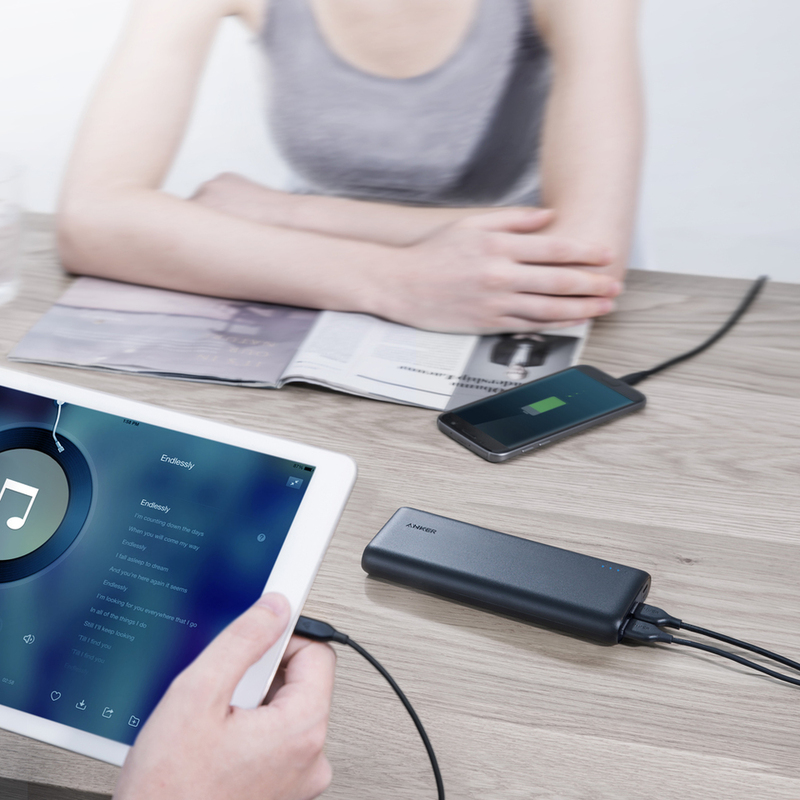 While the PowerCore 20100 Portable Charger works with Apple iPhones, iPads and newer Android phones with a USB-C port, only a microUSB charger cable is included in the Anker PowerCore 20100 box. You’ll have to use your own Apple lightning cable or USB-C cable to charge those devices. Anker strongly suggests that to ensure best performance you should use your device’s original charging cable, a third-party certified cable (such as MFI) or the included Anker cable to connect your device to the Anker PowerCore 20100. 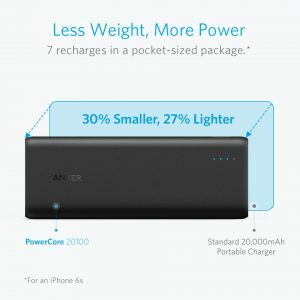 At 356 g / 12.6 oz this Anker 20100 4.8 amp model is the lightest of their options around 20000mah in capacity, which is important if you are going to carry it around a lot. The faster charging PowerCore+ 20100mAh USB-C model is almost 500 grams in weight. Comparing against another popular battery bank brand Xiaomi, their Mi Power Bank 16000mAh Model NDY-02-AL weighs 360gm which is a few grams heavier than the Anker PowerCore 20100 and also 4100mah less battery capacity. The Anker Powercore 20100 is a great battery bank for gadgets that don’t support Qualcomm quick charge because it has 2 x 2.4 Amp USB charging ports, the fastest speed an iPhone or iPad can charge at. Yes, it can charge two devices simultaneously. But please note that when using 2 output ports simultaneously, the total output current will not exceed 4.8A. Many modern compact digital cameras can also charge via USB so this battery bank would be useful if you’re going camping with your digital camera in the outback or on safari where you don’t have access to a mains power point to recharge while you’re asleep. If you have an Android phone or tablet that supports Qualcomm quick charge (QC) then this Anker battery bank will recharge it a lot more slowly than a QC enabled powerbank or wall charger can. This battery bank has a micro USB port which you use to refill the battery bank with power. Using a 2 amp wall charger expect to take about 11-12 hours to fill the battery bank from empty to full. If using a 1 amp wall charger it would take 22-24 hours instead. When testing this battery bank to recharge a nearly flat Samsung Galaxy Note 8, the recharge speed across multiple tests was about 1% per minute, slowing down after the device reached about 3/4 charged. As an example if starting at 22% charge, the phone took 60 minutes to reach 77% (+55%) and 100 minutes to reach 100% (+78%). Should you buy the PowerCore 20100 Power Bank? If you must have a large charging capacity and you need the lightest possible battery bank with about 20000mah capacity then this is a great option. 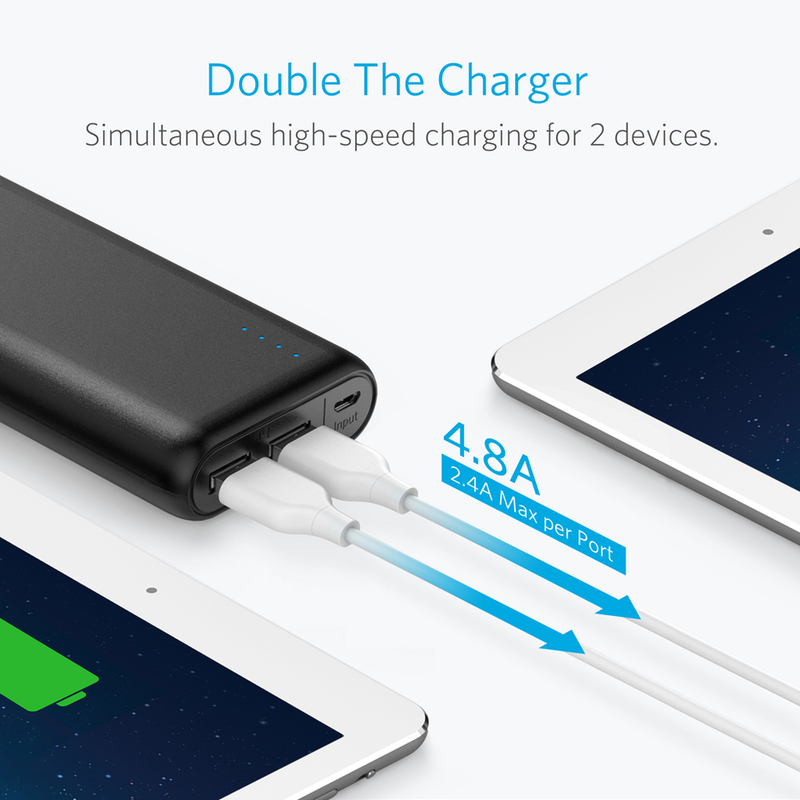 If you only have iPhones, iPads, Android and other devices that charge at 2.4 amps and support Qualcomm quick charge then save your money and buy the Anker Powercore 20100, you don’t need to purchase a more expensive quick charge capable powerbank. However if you need a battery bank with USB C ports and quick charge ability, search the Macfixit site and have a look at other Anker battery banks that support these features. At time of writing the Anker PowerCore 20100 was available for sale on the Macfixit site for AUS $99.99 plus postage.